It's always interesting to have a sneak peak behind the scenes. So this year we have interviewed the directors and actors that make up our 2015 company. We ask them all the questions you want to know. We will also be uploading trailers and audience reactions for the shows as we go. Bard in the Botanics are looking to recruit a Wardrobe Assistant under the FST / CPTS Bursary Scheme to work alongside our Head of Wardrobe on this year’s Byre Theatre panto, Jack and the Beanstalk. The placement is an opportunity for a recent graduate to develop the necessary skills and contacts to undertake further work, providing a bridge from formal training to professional employment. Applicants must have graduated from a Scottish Further or Higher Education body in the last 2 years with a specialism in Wardrobe. Bursary - £350 per week. While we are always optimists regarding weather here at Bard in the Botanics (you have to be to do outdoor theatre in Scotland! ), we are also realists and the weather forecast for Saturday 12th July is not looking particularly good at the moment. So if you have booked tickets for The Comedy of Errors on Saturday 12th July but don't want to risk missing out on seeing the show because of weather, we will honour your booking at this evening's performance (Friday 11th July). All you need to do is bring your name and your booking reference to our box office in the Botanic Gardens Tearoom any time after 6.30 p.m. this evening and we will issue you tickets for this evening's performance of The Comedy of Errors. Your booking for Saturday 12th July will then be cancelled to ensure tickets can't be used twice. If you're unable to come this evening, your tickets for Sat 12th will still be eligible for a refund should we be forced to cancel the performance tomorrow. Unfortunately, because of limited capacity, we cannot offer the same deal to our audiences for Hamlet - that performance is sold out and we do not have the space to admit additional audience members. We hope this will help as many people as possible enjoy our performance of The Comedy of Errors. The Comedy of Errors opens! The opening weekend of The Comedy of Errors has been and gone but we've still got 2 more weeks of performances. Not sure whether to come along or not? Why not take a look at some of the reactions to the show to help you make up your mind! THE HERALD – 4 STARS – National and personal identity are artfully explored in The Comedy of Errors...The tartan stylings of Carys Hobbs’ costume design immediately add a frisson of referendum rhetoric..The double act of James Ronan and Robert Elkin (as Antipholus and Dromio of Syracuse) means the practically panto-like action is in very safe hands. The farcical situations (cue gas gags and even the Benny Hill theme tune) are also played out convincingly by the further members of the cast – Nicole Cooper’s wailing wifie Adriana is worth a special mention, as is Kirk Bage’s scene-stealing performance as conjuror Dr Pinch...the Scottish music selection keeps the biting cold of the Botanic at bay through the tartan-tapping of toes. THE SCOTSMAN – Gordon Barr’s riotous 12-strong company..romp through their wild take on Shakespeare’s early comedy...As ever, Barr’s gifted company are not short of bright ideas on bringing new life to Shakespeare...I’ve never seen a production that tackled Shakespeare’s endless punning comedy so boldly, drawing the audience into the verbal battle between Robert Elkin’s Dromio of Syracuse and various adversaries like the crowd at a rap slam...there is a fine choral rendition of The Proclaimer’s I’m On My Way to round off the evening and send us home happy. Went to The Comedy of Errors last night and had a brilliant time. So very funny with excellent use of music throughout. Laughed and laughed - not to be missed !! Just back from tonights performance. Fabulous! ***** - LOVED the Comedy of Errors last night. Very, very funny, brilliant cast, loved the songs and tartan costumes. The whole look of the show worked so well and the play was brought to life with clever direction. 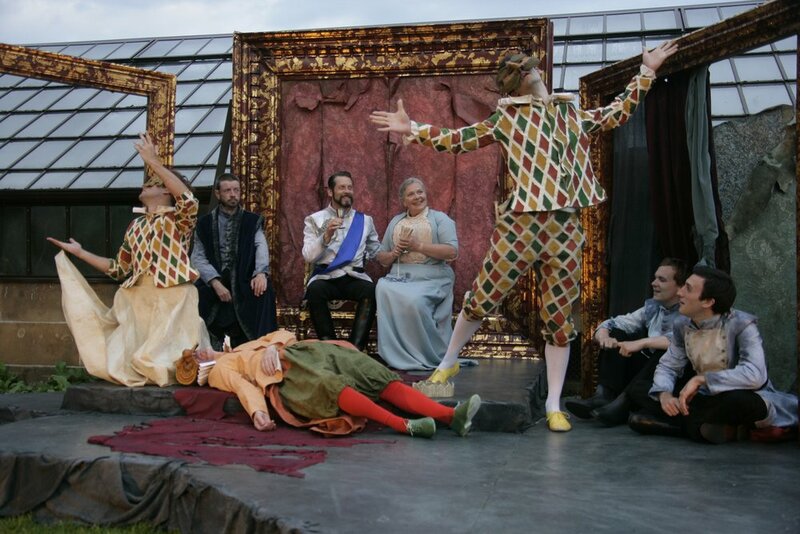 The opening night of 'The Comedy of Errors' last night @bardbotanics was spectacular! Glasgow people, don't miss that brilliant show! Wasn't sure what to expect from Comedy of Errors at @BardBotanics cos it's not the best play, but it was genuinely hilarious. Recommended. We're back behind the scenes for our last company interview before we start rehearsals for Bard in the Botanics 2014. This time, we're chatting to set designer, Giggy Argo, who has been responsible for nearly all our beautiful designs in the past 5 years. Here's what she had to say about her time at Bard in the Botanics. I think my first encounter was painting the venetian blinds for (former Head of Design) Sarah Paulley’s Merchant of Venice design, which turned out to be not to be as easy as it sounds! However that was the same season Sarah put me forward for the Design of the B in the Park Productions of Love’s Labours Lost and A Midsummer Night’s Dream and I can’t remember which I actually started working on first. Obviously all of the production team work wonders and I could happily start listing names and accolades but I think they have all already been praised by other members answering this questionnaire. Personally my unsung hero has to be Ricky McKenzie who has built all of my designs and some of Sarah’s. Good carpentry is something that never gets mentioned in a review but it would certainly be obvious if the workmanship was poor! Rickys standards are incredibly high and he does a fantastic job of understand my designs and the demands that working outdoors puts on a stage. I agree with Carys that Paul was fantastic in Hamlet however everyone was brilliant in Hamlet so it’s a tough call. I think I could have watched it a hundred times over especially Finlay as the Gravedigger but maybe that was partly to do with the Aberdonian twang he had. I think overall my favourite production is Hamlet. Everything just came together so well, we had had a design/concept meeting quite early on then went off to play with ideas. When we came back it was like myself and Carys had been developing our ideas in the same room. It was also my first big set for Bard that was all my own, I love run down/deteriorated designs and then seeing Jens reaction before the set was even complete I knew she was happy. Then to top it all off Cary’s costumes, wow! I am totally gutted that I never got to see A Midsummer Night's Dream in 2011, everyone raved about it. I was working on the Hamlet set in Edinburgh at the beginning of the run then the set went into the gardens and I remember working late on a couple of nights and hearing the music floating across the gardens. I think if I could get away with it I would move to the country and live in all the As You Like It 2012 forest costumes. Whether it’s my favourite or just the most emotional area for me I don’t know but at the end of the day whether I’ve been building, painting, watching rehearsals on the set I like to go to the top of the lawn where the audience sits and look down on the stage and see how its all coming together. It can be quite nerve wracking walking up there and knowing you have to turn round and see everything as a whole for he first time. Well I have to admit I’ve not read them all to make a fully educated decision but then there is such a difference between reading a Shakespeare and seeing it brought to life. The direction can make or break a production but with the way Jen and Gordon bring such fresh ideas with them and their understanding of the texts I would be excited to see their take on any of the above. It’s their interpretations that make the shows show enjoyable and the audiences coming back to brave the weather year after year. We've been meeting a lot of familiar faces recently so now it's time to head behind the scenes and catch up with one of the key figures at Bard - Head of Wardrobe and Costume Designer, Carys Hobbs - a bit of a genius when it comes to creating hundreds of costumes for us over the years. My initial contact with Bard was just prior to the 2009 season, when I was approached to join the company as Wardrobe Supervisor by then Head of Design, Sarah Paulley…I jumped at the chance and was designing the costumes for that season very shortly afterwards. Oooh, a toughy; because really everyone involved is….but I guess, if I was pushed I would have to say the whole production team, Giggy Argo the set designer & maker, Suzy Goldberg, Sam Ramsay and all the stage managers I’ve worked with in the last 6 years and Gordon and Jen. The hours that everyone puts in before, during and after the season are staggering. The whole team is like a swan; calm and serene on the surface, but we’re paddling like mad underneath. Another tough one…I loved all the performances in “Much Ado About Nothing” last year, it made me laugh and cry, and Stevie Clyde’s “Bottom” was fabulous (as it were), but if I had to choose just one, it would be Paul Cunningham as “Hamlet.” An entrancing performance, I could watch again and again. I think, overall, the whole of the 2011 season (our 10th Anniversary Season) is one I look back on with immense satisfaction. Gordon and Jen put their trust in me & just let me go for it. I pushed the design concepts for the pieces and what was possible within our budgets. The costumes for “A Midsummer Nights Dream” were so fun to make and the design for Hamlet had such a lustrous finish, that every time I see the pictures I am proud of them and how both sets of costumes were integral to those productions. I wish I’d been able to see Pericles in 2011. Unfortunately with my schedule and the amount of costumes that year, I couldn’t get to it. But I wish I had because everyone raves about it and the pictures are gorgeous! Ooh, that’s like asking me to pick my favourite child. I love them all…. Each set of costumes for each show has a story, memories of what was happening when I was designing, the first day of the season when I show the designs to the company and how they react, the first fittings, the first dress rehearsal; watching the actors settle in to them and make them their own. It’s too hard, I can’t pick just one. But I can say the one that makes me laugh most was definitely Oberon’s sequined trousers….I’m not sure what came over me when I was designing them, but I think John P Arnold pulled them off. The spot on the lawn where I like to sit for the final rehearsals, with my bag of stuff, my note book and my anti-midge “skin so-soft” spray. It’s where I finally get to see everyone in their costumes all at once and know that the concept is working. I always feel good once we’ve reached that point. I think, Love’s Labours Lost will be beautiful when it’s time comes, and The Merry Wives of Windsor will be a raucous event if Gordon Barr has anything to say about it. But really, I’d like to do them all! What We Have Been / What We May Be We're speaking to Nicole Cooper this week, who has been a familiar face at Bard in the Botanics since 2009, playing roles including Rosalind, Viola, Ophelia and Desdemona. It is definitely the stage management/ production team. They work so hard to make sure the season comes together and are often in the gardens packing up, waterproofing, resetting etc. hours after the show has finished – even if it's pouring! I have been so lucky to play some of the best characters ever written. I don't think I can single one out because I've had 'moments' with all of them. I think the most fulfilling thing is to feel like you've told that persons story in the most truthful way you can – that you have had a connection with the audience, made them laugh or cry. The fact that we can see our audience in BITB productions means that when you get those moments in a show you can really feel it. I always felt it at the end of As You Like It when I sang Rosalind's farewell song! I wish I had seen Merchant of Venice. Although I know the play, I've never seen it before and its a production that everyone still talks about and remembers fondly. Firstly can I just say Carys Hobbs-Sargeant is a miracle worker and every year she creates the most beautiful costumes. I loved my Ophelia dress and my Rosalind/Ganymede costumes. And I usually have costume envy for Beth Marshall's costumes – she always looks amazing! 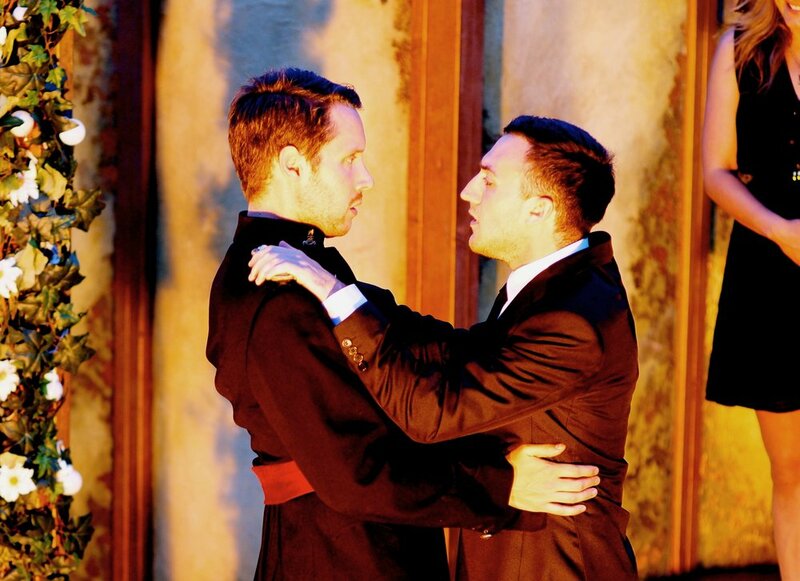 I remember walking into the gardens for my audition for Richard III and I was so nervous. I found a quiet place near the Kibble Palace to sit and focus before I went in and now every time I walk past that spot I remember that moment. I'm looking forward to the extravaganza that will be Love's Labours Lost one day – it has a massive cast with so many different stories going on through it. I'd like to see what Gordon or Jen would do with that! I also love Cymbeline and it would be great to see a production of that play.